Download "Running for Freedom: The Fugitive Slave Law and the Coming of the Civil War"
1 Running for Freedom: The Fugitive Slave Law and the Coming of the Civil War This activity compares a runaway slave ad and an abolitionist poster to explore the causes and effects of the 1850 Fugitive Slave Law. The law changed how many northerners viewed slavery and intensified conflicts that brought the nation closer to Civil War. Essential Questions How did slaves, through their actions, challenge the authority of slave owners and the legitimacy of slavery. What were the Constitutional conflicts over individual liberty versus property rights, including the Fugitive Slave Law? How did the Fugitive Slave Law serve to strengthen the abolitionist movement? Instructions 1. Step 1: We will review the timeline of compromises over slavery and discuss the following points: There had been conflict between slavery and freedom since the beginning of the republic The meaning of the phrase "secure the Blessings of Liberty" to Americans in the 1790s 2. Step 2: Please locate the documents "Runaway Slave Advertisement from Antebellum Virginia" and "Caution!" 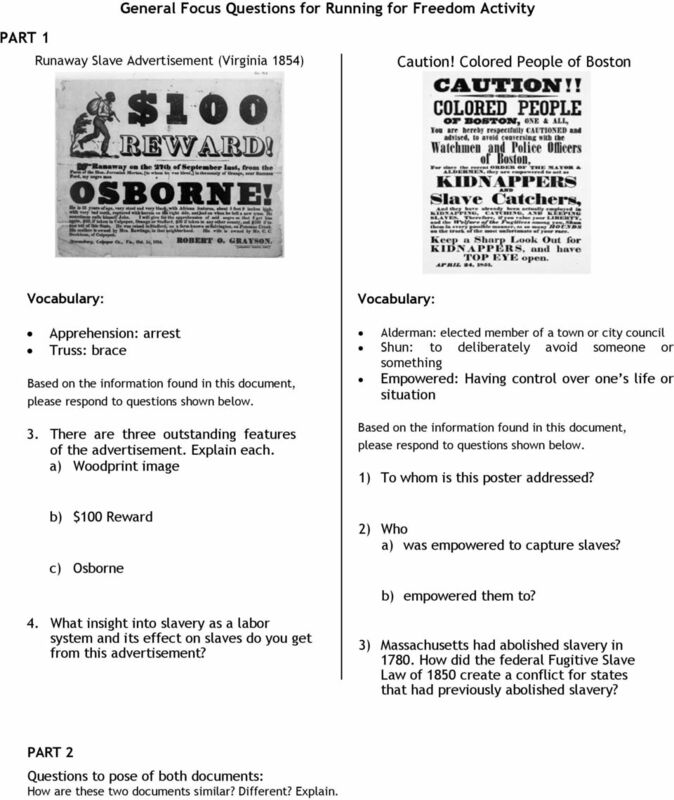 poster warning runaway slaves of slave catchers, and their accompanying analysis worksheets (three). If this is being done in class, you will work with a partner to read and analyze the one document at a time (including the description), and Part I of the General Analysis Worksheet for that document. We will review as a class, and then complete the analysis of the other document and Part II of the General Analysis Sheet. If this is HW, just work through it individually. 3. Step 3: GTS: You are to individually write a response to the question "How did people in the North and South resist slavery?" Historical Context With the Compromise of 1850, the North and South avoided--or more accurately, delayed--a struggle that threatened to rip the Union apart. The Compromise included a Fugitive Slave Law, which empowered the federal government to prosecute northern whites who shielded runaways. Bounty hunters sometimes wrongfully seized free blacks born in the North as escaped slaves. In response black Americans and their white allies used force to protect fugitive slaves, sometimes attacking or even killing their pursuers. Conflicts sparked by the Fugitive Slave Law also infuriated southern slaveholders, who believed that the federal government was failing to keep northern abolitionists in check. 2 Timeline of Compromises over Slavery From the nation's very inception, the existence of slavery stood in glaring contrast to the ideals of liberty and justice expressed in the preamble to the Constitution. The Constitution itself protected the institution of slavery (while never actually using the word slave) through a number of compromises worked out between pro-slavery and anti-slavery factions. These constitutional compromises did not resolve the conflict, however, and Congress passed other compromises in an effort to prevent the young nation from breaking apart. We the People of the United States, in Order to form a more perfect Union, establish Justice, insure domestic Tranquility, provide for the common defense, promote the general Welfare, and secure the Blessings of Liberty to ourselves and our Posterity, do ordain and establish this Constitution for the United States of America. Preamble to the United States Constitution The Constitution The Three-Fifths Compromise provided a formula for calculating a state s population, in which three-fifths of all other persons (i.e., slaves) would be counted for purposes of representation and taxation. The Constitution also included a provision to ban the importation of slaves starting in 1808, and a fugitive slave clause requiring escaped slaves to be returned to their owners. Fugitive Slave Act (1793) Required that escaped slaves found in free states be caught and returned to their masters. The Act also denied freed slaves the right to a jury trial and other constitutional rights. Missouri Compromise (1820) Banned slavery in the Louisiana Territory north of the parallel, except within the borders of the state of Missouri, which would be admitted as a slave state; Maine to be admitted as a free state. Second Missouri Compromise (1821) Missouri was admitted as a state despite a provision in its constitution excluding free negroes and mulattoes from the state. Gag rule in Congress ( ) When abolitionists began submitting petitions about ending slavery to Congress, proslavery representatives passed a "gag rule" that prevented those petitions from being discussed. 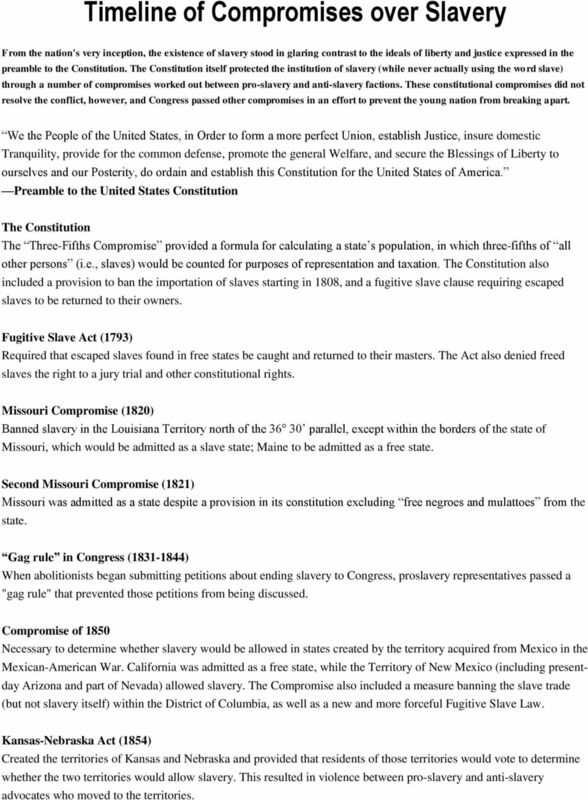 Compromise of 1850 Necessary to determine whether slavery would be allowed in states created by the territory acquired from Mexico in the Mexican-American War. California was admitted as a free state, while the Territory of New Mexico (including presentday Arizona and part of Nevada) allowed slavery. The Compromise also included a measure banning the slave trade (but not slavery itself) within the District of Columbia, as well as a new and more forceful Fugitive Slave Law. Kansas-Nebraska Act (1854) Created the territories of Kansas and Nebraska and provided that residents of those territories would vote to determine whether the two territories would allow slavery. This resulted in violence between pro-slavery and anti-slavery advocates who moved to the territories. 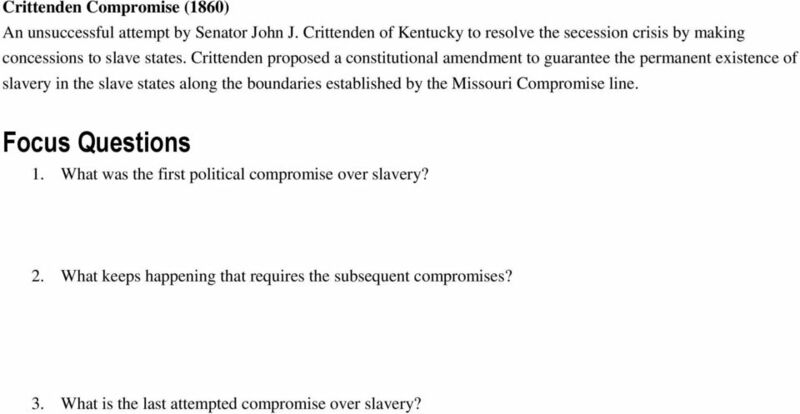 3 Crittenden Compromise (1860) An unsuccessful attempt by Senator John J. Crittenden of Kentucky to resolve the secession crisis by making concessions to slave states. Crittenden proposed a constitutional amendment to guarantee the permanent existence of slavery in the slave states along the boundaries established by the Missouri Compromise line. Focus Questions 1. What was the first political compromise over slavery? 2. What keeps happening that requires the subsequent compromises? 3. What is the last attempted compromise over slavery? 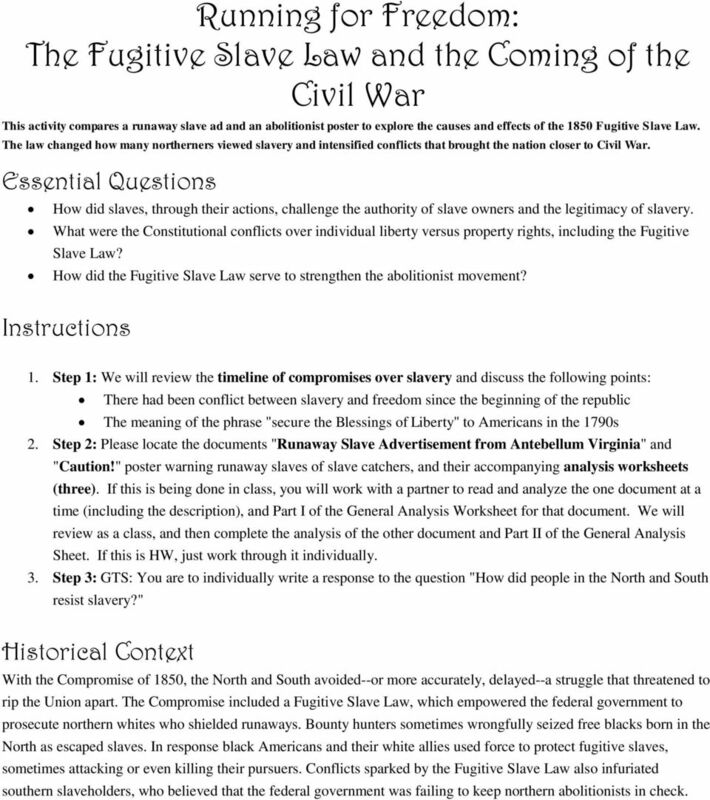 7 Analysis Worksheet: Boston Abolitionists Warn of Slave Catchers Complete the following from information you get from the description at the top of the page and the poster. If choices are given for the answer, circle the correct choice. 2. The poster is dated [ 1841 / 1851 ] 3. Who is meant to see the poster? escaped slaves free African Americans all of the above Vocabulary for Poster conversing: talking, having a conversation aldermen: elected city council empowered: given authority or permission to do something welfare: health and happiness fugitive: someone who has escaped shun: avoid something or someone on purpose 3. Use your vocabulary to answer the following: The poster says they should avoid [talking with / touching / fighting with] the city s watchmen and police officers. 4. The mayor and aldermen of Boston gave permission to the city s watchmen and police officers to: a. Go to the South and kidnap slaves b. Capture any escaped slaves in the city of Boston c. Keep their own slaves 5. 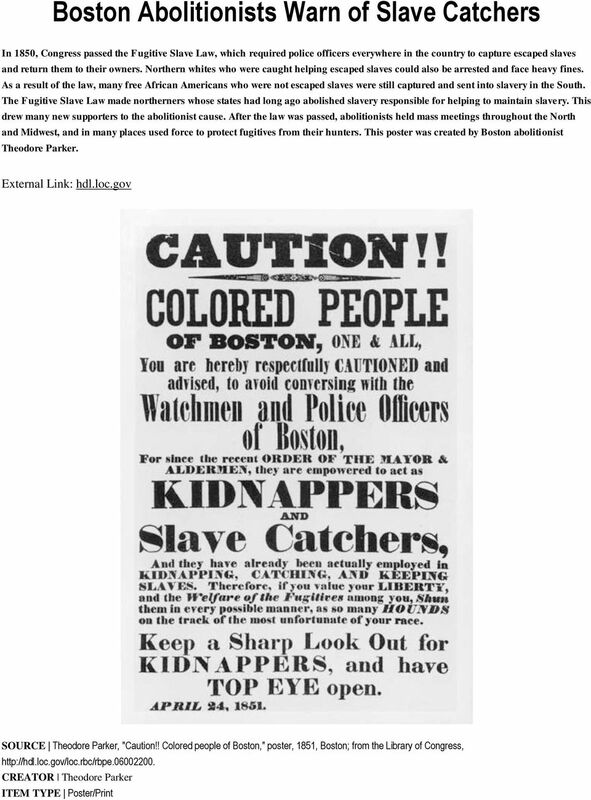 Use the description at the top of the document to answer the following: Massachusetts abolished slavery in Why would a poster in 1851 be telling people to look out for slave catchers? 6. How is this poster an example of the conflict between what is the right thing to do and what is the legal thing to do? 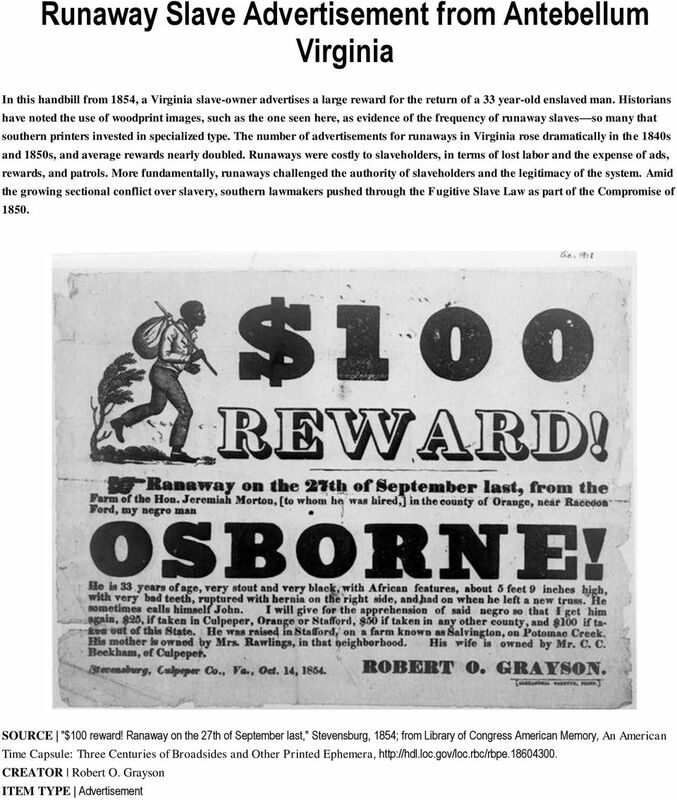 8 General Focus Questions for Running for Freedom Activity PART 1 Runaway Slave Advertisement (Virginia 1854) Caution! Colored People of Boston Vocabulary: Apprehension: arrest Truss: brace Based on the information found in this document, please respond to questions shown below. 3. There are three outstanding features of the advertisement. Explain each. a) Woodprint image b) $100 Reward c) Osborne Vocabulary: Alderman: elected member of a town or city council Shun: to deliberately avoid someone or something Empowered: Having control over one s life or situation Based on the information found in this document, please respond to questions shown below. 1) To whom is this poster addressed? 2) Who a) was empowered to capture slaves? b) empowered them to? 4. What insight into slavery as a labor system and its effect on slaves do you get from this advertisement? 3) Massachusetts had abolished slavery in How did the federal Fugitive Slave Law of 1850 create a conflict for states that had previously abolished slavery? PART 2 Questions to pose of both documents: How are these two documents similar? Different? Explain. 9 GTS: 1. 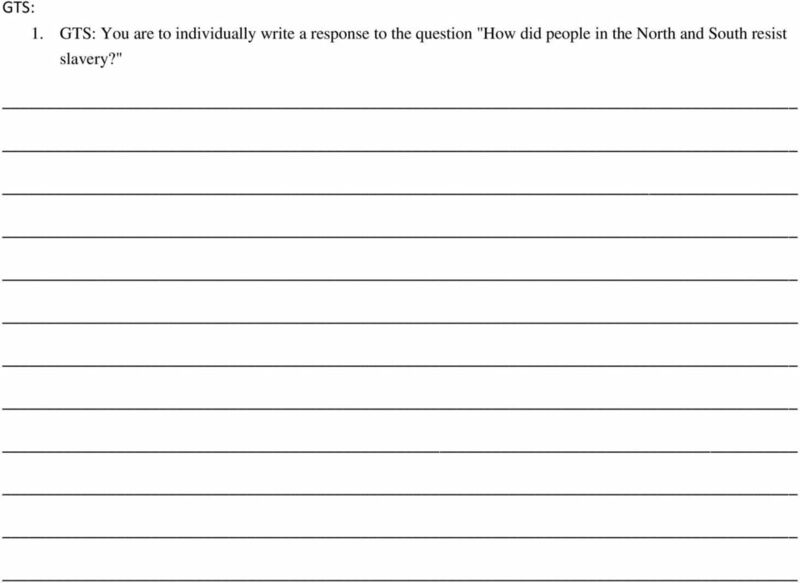 GTS: You are to individually write a response to the question "How did people in the North and South resist slavery?" Race. Social Change. The Social Construction of Reality 10/18/2016. If [people] define situations as real, they are real in their consequences. Abraham Lincoln Lesson Plan. Central Historical Question: Was Lincoln a racist? Second Middle Passage Timeline. 1600s Cotton was cultivated for the first time in the American South. What was the role of compromise leading up to the Civil War?